For companies thriving in the digital age, segmenting their target audience has become common practice. Marketing and UX design teams are among the firsts to adopt user personas in their process. But personas are not just a one time exercise. They help organizations achieve precision in decision-making across teams and stakeholders. Below, we’ll walk through six use cases and ways to segment your audience. For marketing, sales, business, customer experience, product management and design. Your starting point to create and share a beautiful and effective user persona comparison, without any design experience. Often, as an entrepreneur, product designer, or marketing professional, you will have a very good sense of who your high-level target market is. Whether you are aiming for affluent millennials, middle-class parents, or urban small business owners, you have identified your larger target market. You know that this is your entry point, or that your product will fit this market best. Not so fast. Having a full understanding of your potential customers’ goals and frustrations lets you think as they do, and respond to questions as they would want throughout the development process. That’s why crafting a user persona is so important. The challenge comes when you try to dig deeper into those high-level markets, figuring out who the real people within your customers are, and identifying the differentiating factors among them. 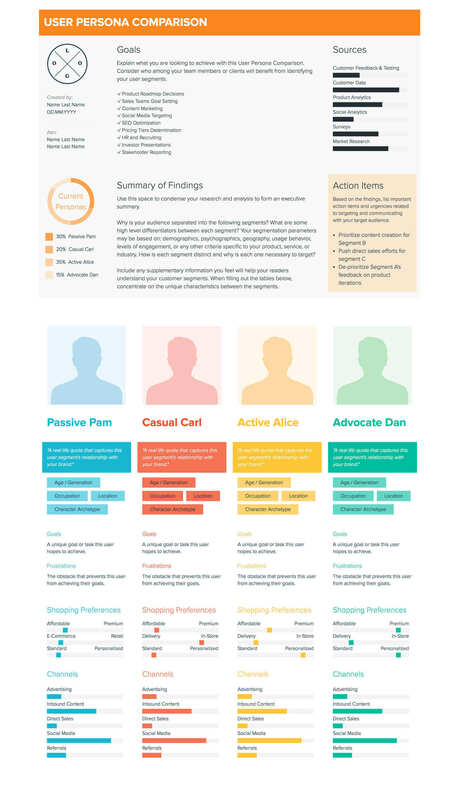 Besides healthy assumptions, your personas need to be based on solid research and data. Best practices dictate that you carry out thorough market research to create more accurate and insightful personas. If you’ve really dug into your customer base, it will become apparent that it is nearly impossible to create just one idealized customer profile. You’ll notice patterns arising, nuances among the members of your user base that funnel them into distinct groups. Now, let’s walk you through how building and comparing multiple personas can help your business. We also provided some generic categories you might want to use to segment your users. These are just examples — feel free to expand upon our suggestions to fit your own company’s needs. We recommend you consider all of the points presented below and determine which segmentation methods make the most sense for your business and its primary objective. Keep in mind that each of your personas will probably fit into multiple segments; one user might be an enthusiast that is a casual, passive user, while another may be a professional that is an active power user. Employ as many segments as you think will be helpful. Your target audience will have varying levels of engagement with and commitment to your product. It’s crucial to identify which user or customer is the perfect early adopter, and which might slip away quickly; who is the most likely to become a long-term customer, and who might be resistant to adoption without a lot of convincing. Understanding various users’ decision-making process and their relationship to your brand is key to the retention of loyal customers and the extension of their relationship with your product or service. Creating multiple personas for customers with different lifecycles will allow you to adapt to these variations while maintaining a laser focus on your ideal user. First-time User – unfamiliar with the product or service, needs convincing to stay. Casual User – infrequent usage, little attachment to the product or service. Intermediate User – regular usage, would be disappointed if service was no longer available. Power User – daily usage, service has become an essential part of his/her life. Passive User – simply uses the product or service with little engagement. Active User – engaged with the online (or in-person) community, shares feedback. Advocate – active user that also publicly supports the product or service. 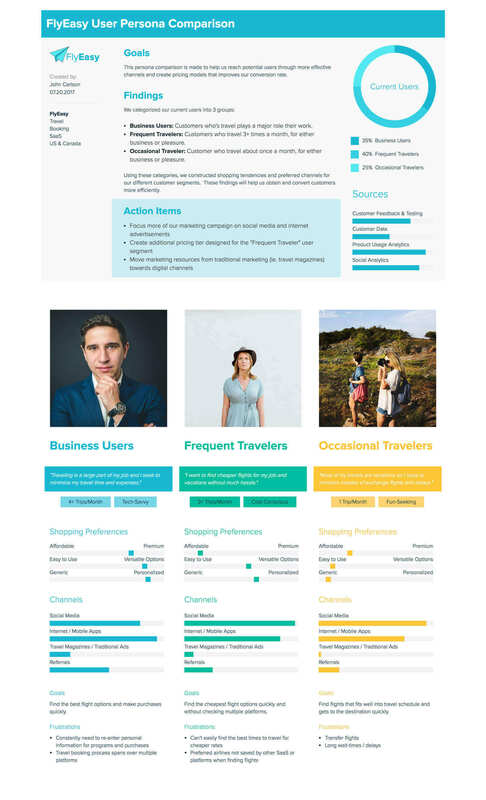 Tip: Check out our User Persona Comparison Template to segment your user base by frequency of use and engagement levels. Users within your target audience will, in all likelihood, have different demands of your product or service. They will intend to use what you’ve built for different purposes, and you must be ready to adapt to these differing demands. Say, for example, your company has developed a drum machine. An enthusiast user will likely only need a few simple pre-programmed beats and some basic functionality to see value in the product, while a professional user will require a great deal more customization and capability. Creating a persona to represent each segment will prepare you to build out the features you need to reach the most valuable segments of your target audience. Enthusiast – uses the product or service recreationally, likely as a hobby. Prosumer – occasionally uses the product in professional context, but not as a main profession or main tool. Professional – uses the product or service in a professional setting, likely as a requirement. 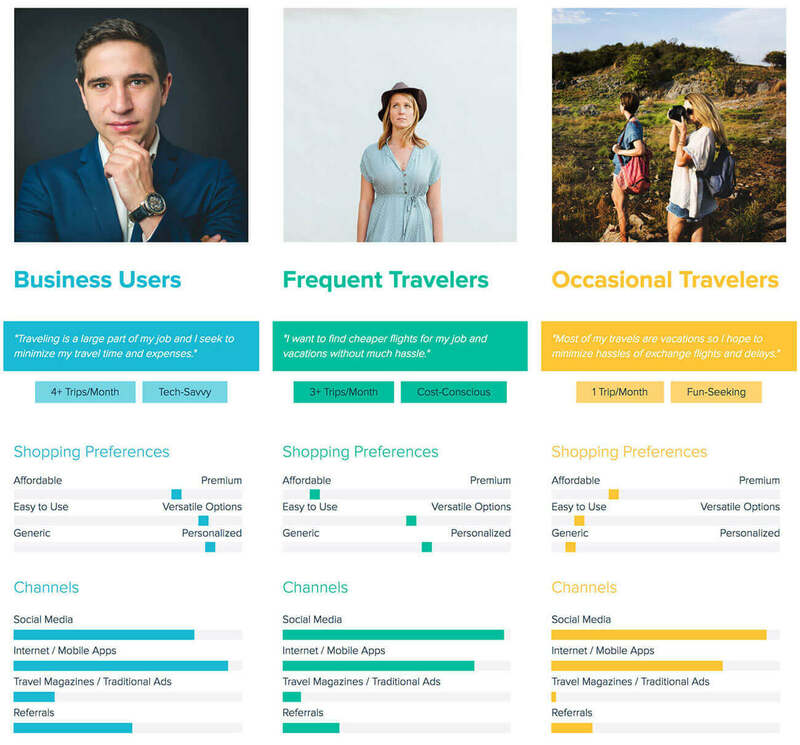 Tip: Use our editable Persona Comparison (above) to segment your multiple user personas based on their usage of your product / services. You’ll likely need to use multiple channels to reach your audience, and your personas can help you determine which channels you should be focusing on. Some of your users may be digital natives, who are most easily reached via Facebook, Instagram, or other social networks. Others may spend a lot of time reading the news or researching online, who will be best reached through banner ads. Still, others may be more traditional, reacting most strongly to email or print campaigns. Your Personas will allow you to examine how each group within your target audience can be most effectively reached. You can also carry out A/B testing by varying your design and copy within and across distribution methods. Social – best reached through social media, is in target demographic but may not be seeking out product or service. Inbound – Best reached through search and owned marketing, actively seeking out product or service. Traditional Ads – best reached through traditional advertising methods, may not even know they need product or service. Knowing the implications of your different personas can be a huge help in deciding which customer segments are taking up most time and resources. At scale, this is a huge topic of concern for customer experience teams. You may want to spend minimal time on a high volume of users and maximum time on a lower volume of highly engaged users. Depending on your business model, you can automate certain type of efforts to boost customer satisfaction and allocate more resources in nurturing your brand advocates. In each case, creating multiple personas will help you identify these user types and focus your efforts. High in the funnel – Probably not aware of the product or service, may be interested but will take a great deal of effort to convert. Middle of the funnel – May be aware of product or service, likely interested and has a decent chance of converting. Low in the funnel – Aware of product or service, definitely interested and already considering converting, easy to convert. Defining your target audience and the groups within it is crucial in determining the pricing model for your product or service. Knowing the different segments of your target audience allows you to make proper estimates on cost, profits, and cost per acquisition. If your primary target group consists of business professionals and your secondary group is entirely college students, you will probably encounter more spending resistance from that secondary grouping. Pricing optimization is a big process. Segmenting your audience based on financial potential will allow you to determine your margins and plan for growth. Free – pays no monetary amount for product or service, but is beneficial due to data, ad placement, or other indirect monetization. Freemium – pays no monetary amount for the basic product or service, but may pay some amount for proprietary features, functionality, or virtual goods. Paid – pays a monetary amount for the product or service. Enterprise – pays a premium for the highest feature set possible, likely for business or teams. It is possible that your product or service will have a variety of user types interacting with it. In some cases, your product may even be the connecting agent between these user types. For example, for digital products, this point especially concerns UX designers, as you’ll have to craft unique product experiences for each user type and their distinct goals. For example, on a SaaS product, user roles may go from viewers, editors, to admins. They will all need to use the same platform for different tasks. Using multiple personas allows your company to predict the needs and wants of each group, and who will need access to what features. Once you’ve determined how you want to divide up your personas, it’s time to actually build them out. 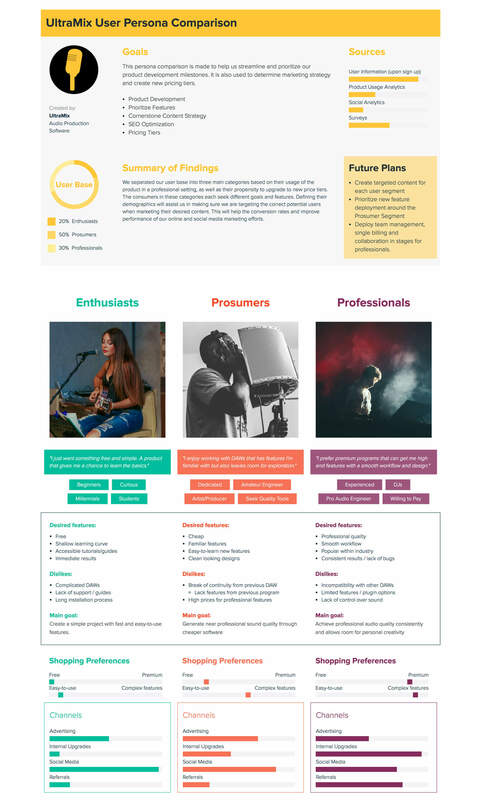 Xtensio’s persona template is the perfect tool for the job. You’re given the tools to divide up your personas in a variety of ways. Create a key and color code them, place your differentiating factors in the traits section, specify which group a persona belongs to in the name field, or even add a new section. The choice is yours. Many product design and marketing decisions will come down to which group of users you are prioritizing. Knowing your target audience is key, and separating them into easily identifiable categories will allow you to focus your marketing strategy for maximum efficacy. Keep in mind that your target audience, and thus your personas, will change over time. Someone who is not a viable target now may become one down the line. Personas represent real people, and like real human behavior they are always changing, and your brand will have to adapt as well. Revisiting your assumptions in an is a constant necessity, and you should be updating your personas with the results regularly.